The game will ship in two editions, the normal one and a '''Limited Edition''', which will allow the player to have early access to two cars in a satin black livery: the Maserati GranTurismo MC Stradale, and the Porsche 911 (991) Carrera S.
The game will ship in two editions, the normal one and a '''Limited Edition''', which will allow the player to get double Speed Points in the first 4 hours of multiplayer, and also early access to two cars in a satin black livery, tuned with special performance packs: the Maserati GranTurismo MC Stradale, and the Porsche 911 (991) Carrera S.
Need For Speed: Most Wanted is the 19th instalment in the long-running Need For Speed series of racing games, developed by Criterion Games and published by Electronic Arts. This game is not to be confused with the original Need For Speed: Most Wanted, which was released in 2005, even though both games share the same name. 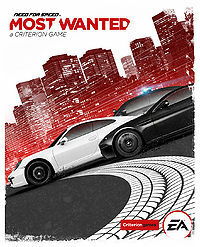 Most Wanted 2012 was officially announced during EA's press conference at E3 2012, and it was revealed by EA that this isn't a remake or the original game, but a kind of modern sequel. The first gameplay video and trailer hint at a mix between Burnout (driving style, crashes, city), Most Wanted/Hot Pursuit (free roam, cop chases, black list), and The Run (cars, graphics, Autolog 2.0). The game will ship in two editions, the normal one and a Limited Edition, which will allow the player to get double Speed Points in the first 4 hours of multiplayer, and also early access to two cars in a satin black livery, tuned with special performance packs: the Maserati GranTurismo MC Stradale, and the Porsche 911 (991) Carrera S.
To be Most Wanted, you'll need to outrun the cops, outdrive your friends, and outsmart your rivals. With a relentless police force gunning to take you down, you'll need to make split second decisions. Use the open world to your advantage to find hiding spots, hit jumps and earn new vehicles to keep you one step ahead. In true Criterion Games fashion, your friends are at the heart of your experience. In an open world with no menus or lobbies, you'll be able to instantly challenge your friends and prove your driving skill in a variety of seamless multiplayer events. Your rivals will do everything they can to stop you from getting to the top. In this world, there can only be one Most Wanted.